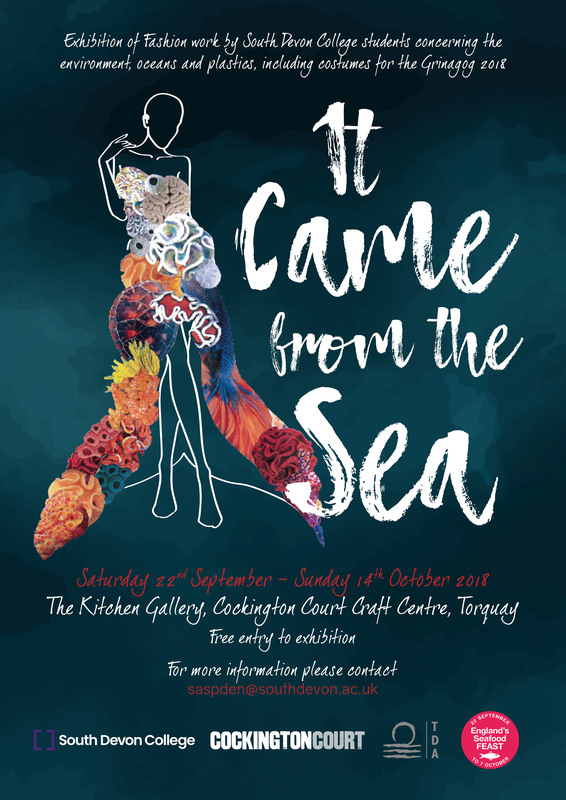 As part of this year’s England Seafood Feast, South Devon College is excited to present the upcoming fashion exhibition ‘It Came From The Sea’. An exhibition featuring a wide range of both past and present Fashion students’ work inspired by the stunning sea and coast lines of Devon, the UK and abroad. The exhibition is a showcase of the finest costume work, fashion design and work in progress from both College level, and foundation degree level students. Costumes on show include selections from the 7th International UNESCO Geoparks opening, The Grinagog Music Festival parade, and students’ work inspired by coastal geology, coral and other sea-themed colour palettes. Held at Cockington Court Craft Centre, a creative hub for local artists, the exhibition is an opportunity to immerse yourself in a vibrant wall of work created by students inspired by the sea and beautiful surroundings of Torbay. When – From Saturday 22nd September to Sunday 14th October 2018. The Fashion department at South Devon College excels at challenging students to the highest level and to meet the ever-growing demand of live projects and real-world clients. This provides our talented and passionate students the opportunity to gain valuable employability skills and experience for the future. South Devon College is an accredited centre of excellence working partnership with the University of the Arts London (UAL). The College offers Fashion courses at Level 2, Level 3 and at Foundation Degree level.